Even if you aren't a fan of the Washington Nationals, you have to appreciate the stellar performance of General Manager Mike Rizzo. Over the past year, Rizzo and the Nationals management have been adding some of the very best baseball people in the game. Together they have turned the Washington Nationals from the joke they were as the Montreal Expos into a team destined to be a power in the sport. Late last night, Mike Rizzo and the Nationals did what Jim Bowden never could, for the second year in a row. They signed the first overall pick in the draft, a Scott Boras client, to a record setting contract. Again, It was the second year in a row. Now it may not seem like a good thing that an organization was so bad that they received the prize reserved for the very worse. But it is when you consider the depths that the Nationals have risen from. The Expos had been stripped of all resources. The prospects had been traded off in a last ditch effort to win. The staff and all its scouting reports and equipment was all taken to Florida when the Jeff Loria ownership group with the approval of MLB screwed them. The went years without a real budget. They did everything on a shoestring until the new ownership finally took over. Meanwhile Jim Bowden had failed to make good use of the resources he did have. Instead, he did the same thing he always did, he collected toolsy but skill less outfielders, and did his best to reassemble the Reds team he once failed to turn into a winner. Now the Nats have a farm system loaded with young but advancing talent. They have a small but strong core of young players in the majors. And they have a front office that can deliver the goods and an ownership group ready to do what it takes to build a winner. 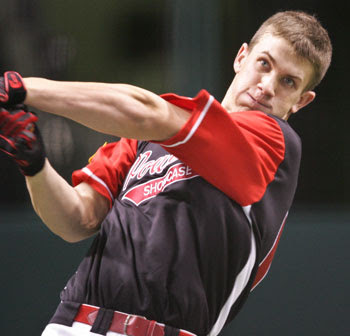 They proved that when they approved a $9.9 million deal to bring the talented 17-year old Bryce Harper into the organization. Bryce Harper has been called baseball's LeBron [James]. Though that is not quite the compliment it used to be after the Event. He has been the star of his high school, summer tournaments, and most recently at the College of Southern Nevada. He has graced the cover of Sports Illustrated twice and I'm predicting a third appearance next week. He has a rocket for a throwing arm and apparently would have been a fine defensive catcher eventually, depending on whose word you trust most. However in an effort to get Harper into the middle of the Nationals lineup as soon as possible, he will be moved to the outfield. 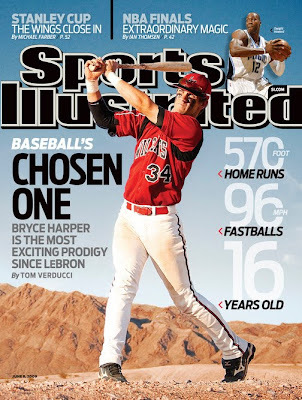 What's next for Bryce Harper and how soon until he joins Stephen Strasburg in the majors? The Nationals believe that Harper is a middle-of-the-lineup hitter of the highest potential. His power is at the top of the scale and he has ever tool you could hope to see in a baseball prospect. But this isn't just a good prospect. Harper is one of the special ones. The opinions on him are nearly unanimous that he will hit and hit for power. He has worked at it for his entire life. It is only a slight exaggeration (if it is at all) to say that it would be more surprising to see him fail than to become a productive major league player. Washington is a sleeping giant of a baseball town and I think it woke up officially with this signing and Strasburg already there. I agree completely. They have the potential to be as big and as popular as any team short of the Yankees.